Woolcool insulated boxes were originally designed for the National Trust's tenant farm shops to ship home-reared meats direct to customers in a more environmentally friendly packaging than polystyrene. In creating the Woolcool insulated box system, multi award winning packaging designer, Angela Morris created revolutionary insulated packaging that is sustainable, recyclable and biodegradable. 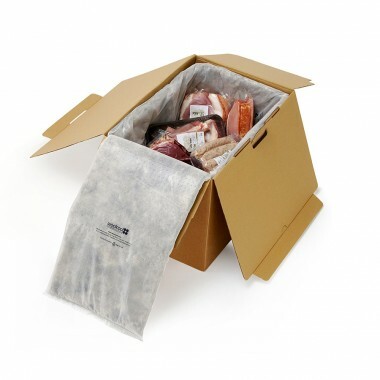 Woolcool insulated packaging has been used and proven by major nationals both in the UK and Europe for over 8 years Abel & Cole, Riverford and Fortnum and Mason to name a few. Woolcool is proven to be more effective than polystyrene at keeping chilled contents consistently colder and fresher for longer, with only half the number of ice packs. The 100% sheep's wool liners are specially designed to line a range of courier boxes, by tucking one liner around the sides and another to line the bottom and top, ie. each Woolcool Courier box is supplied with two made-to-measure liners. The boxes are made with a high strength corrugated cardboard with a clever construction to give additional strength and protection, easy and quick to assemble without the need for tape. Ice sheets are included to establish the required temperature, (although fewer ice packs are needed than in polystyrene packaging or foiled bubblewrap) and the insulation then maintains chilled items below 5°c for 24 to 48 hours. We recommend Sorbafreeze. Note: These prices are excluding Sorbafreeze and delivery.